Edward Petri Jewelers and manufacturers was founded by Edward Petri in 1922. His firm created and manufactured jewelry in the European fashion using platinum, the king of metals, with diamonds and fine gemstones. He was considered to be one of the finest jewelers of his time. The third owner is currently Charles (Charlie) F. Walker and he continues to hand fabricate and custom make jewelry with equipment from the 1890’s. 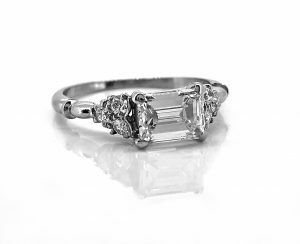 This stunning diamond Petri Antique engagement ring, crafted in platinum, features a center 1.10ct. apx. emerald cut diamond with VS1 clarity and H color. Accenting European cut diamonds with approximately .20ct. apx. total weight with VS1-VS2 clarity and G-H color enhance this special ring. Bright and lively diamonds make this uniquely fashioned diamond engagement ring an enduring example of the Art Deco time period.